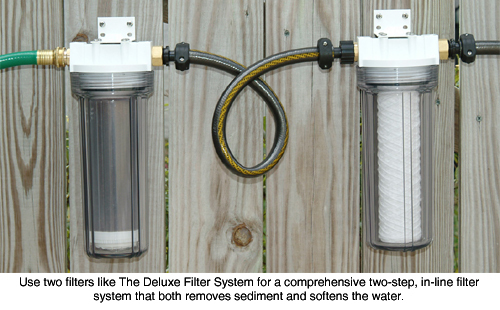 Deluxe Filter System - Two part filtration removes minerals and sediment! This 2-step filtration system prevents two of the most common culprits of micro-marring. You wouldn't rub sand on your paint finish; why would you wash your vehicle in sediment and hard water? 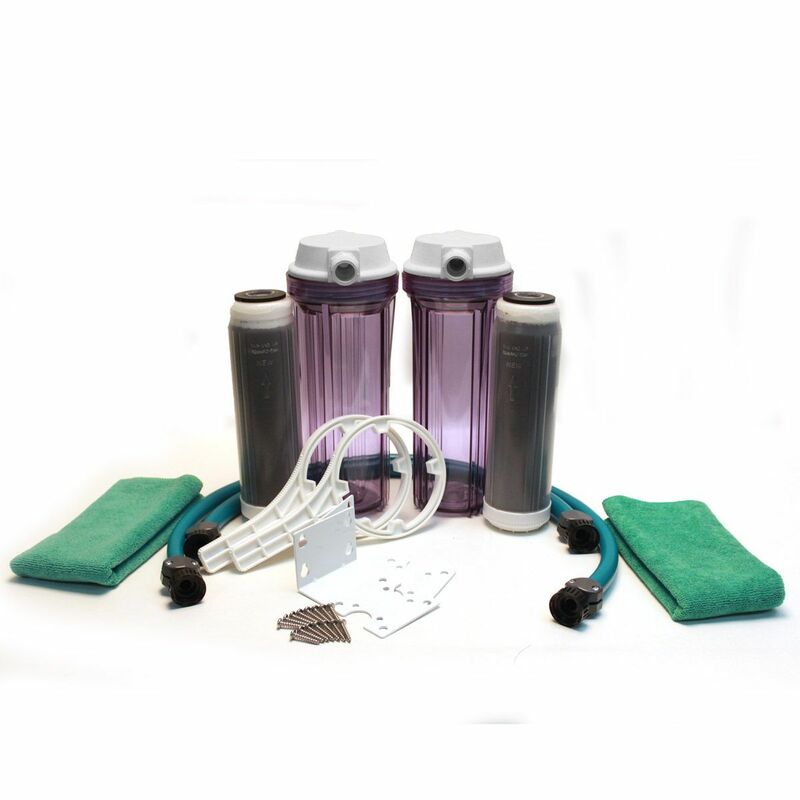 The Deluxe Spot Free Water De-Ionizer Kit includes everything you need to set up a simple two-step filtration system for car washing. Minerals, particularly calcium and magnesium, are what constitute hard water. Hard water is responsible for water spots, poor-lathering shampoo, and that green ring around your bathtub. The calcium and magnesium actually harden inside pipes (called scale) and on other surfaces, including your vehicle. When you rinse with hard water, you could be dousing your vehicle with hard mineral deposits. The only way to prevent hard water deposits is with a water softener. A one-step, in-line filter will remove one of these problems, but what if your water is particularly hard? Well water almost certainly contains sediment and minerals because it is not filtered through a water treatment plant. But even city water can contain both sediment and hard water. That's because many water treatment plants add lime to the water to raise the pH in order to spur the chemical process that removes debris from the water. Lime adds to hard water. In short, most of us need a two-part filtration system to ensure that the water coming out of the garden hose is truly clean. The Deluxe Spot Free Water De-Ionizer Kit is a comprehensive two-step, in-line filter system that both removes sediment and softens the water. This one package is all you need to ensure you're washing your vehicle in clean, soft water. There's no point in preventing water spots if you're using the wrong towels! We've included two top quality microfiber towels to ensure that your paint finish is safe from scratches while you detail. You will need three hoses total for a two-part filtration system. We've supplied two of them in this kit; just add your standard hose to complete the installation. This 3 ft hose is perfect for connecting the spigot and filter unit. Connect the 2 ft. hose between the two filter units. The small size of these hoses makes the installation look neat and organized by eliminating any unnecessary hose length. Use these microfiber detailing cloths for drying, buffing, or as a finishing wipe down. Microfiber is designed to be light, strong, super-absorbent and quick drying. The fibers are non-abrasive, and are woven so tightly that it's absolutely lint free and extremely durable. Unbelievably, these ultra-tough fibers are engineered to absorb seven times their weight in moisture. 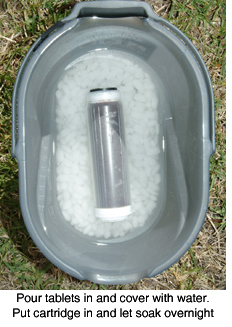 The Deluxe Spot Free Water De-Ionizer Kit is a practical solution to hard water and sediment. 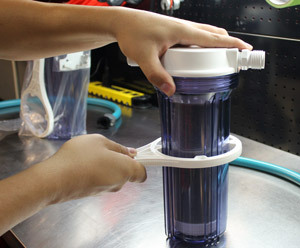 The entire system can be attached to your hose and removed as needed. If you prefer to leave it in place, mount the two clear filters to the wall by the spigot. 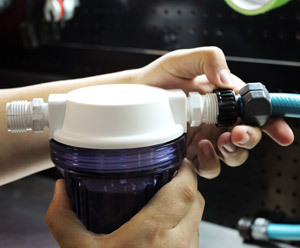 We recommend attaching a Y-valve to the spigot so the filter system can remain connected when not in use. The Deluxe Spot Free Water De-Ionizer Kit (pictured) provides two Spot Free Water De-Ionizer Canisters, ensuring your water is sediment, mineral, and spot-free! Remember, if you're washing your vehicle with unfiltered water, you could unknowingly be pouring hard water scale or sediment on the paint finish. The Deluxe Spot Free Water De-Ionizer Kit eliminates both culprits so the water that cleans your vehicle is truly clean. A total retail value of $173.95. Save $28.96! Your vehicle is only as clean as the water you use! 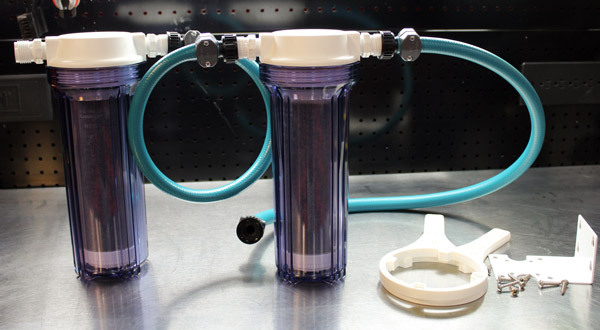 The Deluxe Clean Water Filter System is a two-part inline filtration system that removes minerals and sediment from the water as it travels through the hose. By eliminating hard water and impurities, your vehicle will receive a cleaner, gentler wash every time! A one-step filtration system eliminates either problem, but many people experience both hard water and sediment. If your poor water quality is preventing you from achieving clean, smooth paint when you wash, get the Deluxe Clean Water Filter System! 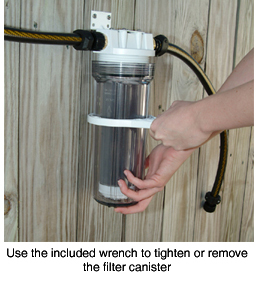 Keep your wash water perfectly clean with these easy-to-install, in-line hose filters. 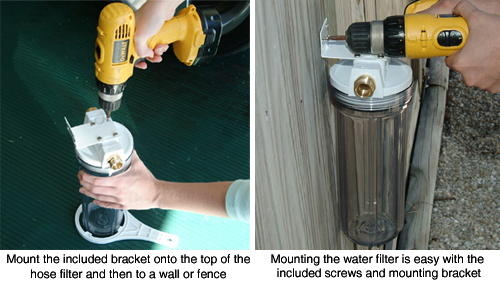 Put a sediment filter cartridge into one unit and a water softener cartridge in the second unit. This two-step system cleans and then softens the water as it travels from the water source to its final destination. Brass hose-adapter fittings ensure long-lasting performance. 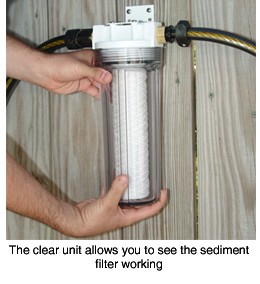 The sturdy plastic housing allows you to see when the sediment filter needs changing. Each unit is 12 inches tall and about 4 ½ inches at its widest point. Each includes a wrench to assist in changing the cartridges and a mounting bracket. This cartridge is made of 25 micron spun poly. It traps fine sediment as the water passes through so that nothing hits your vehicle but pure water. Sediment may include sand, rust, and hard water scale. If you don’t have a hard water problem, this cartridge is all you need to filter your water. You will need three hoses total for a two-part filtration system. We’ve supplied two of them in this kit; just add your standard hose to complete the installation. This 3 ft hose is perfect for connecting the spigot and filter unit. Connect the 2 ft. hose between the two filter units. The small size of these hoses makes the installation look neat and organized by eliminating any unnecessary hose length. Constructed of the finest quality microfibers the Cobra Detailing Towel sets the standard with an outstanding 80/20 blend of polyester/polyamide filament, woven so densely they boast over 200,000 strands of fiber per square inch of fabric! These strands are nearly invisible to the naked eye, and are 100 times smaller than a human hair! Use this cloth for cleaning, buffing, and wiping away wax. 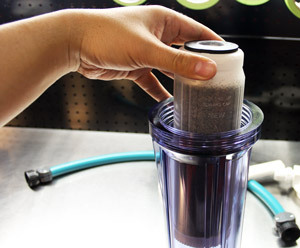 The Deluxe Clean Water Filter System is a practical solution to hard water and sediment. 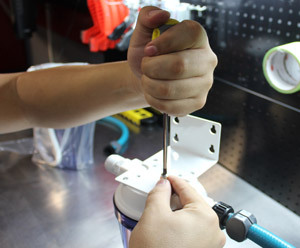 The entire system can be attached to your hose and removed as needed. If you prefer to leave it in place, mount the two clear filters to the wall by the spigot. We recommend attaching a Y-valve to the spigot so the filter system can remain connected when not in use. your vehicle is truly clean. A total retail value of $157.91. Save $17.92!